Admire the elegant and transitional design in the new TV Bench from the Kansas Collection by CorLiving. This timeless staple item is featured in our transitional Espresso finish accented with imitation nickel handles, 3 drawers and 3 open shelves. Offers a variety of open and concealed storage making it the perfect solution for your home theatre system. This timeless bench is perfect for your most important A/V components and can accommodate most TVs up to 60". Easy to assemble so you'll be set up in no time. 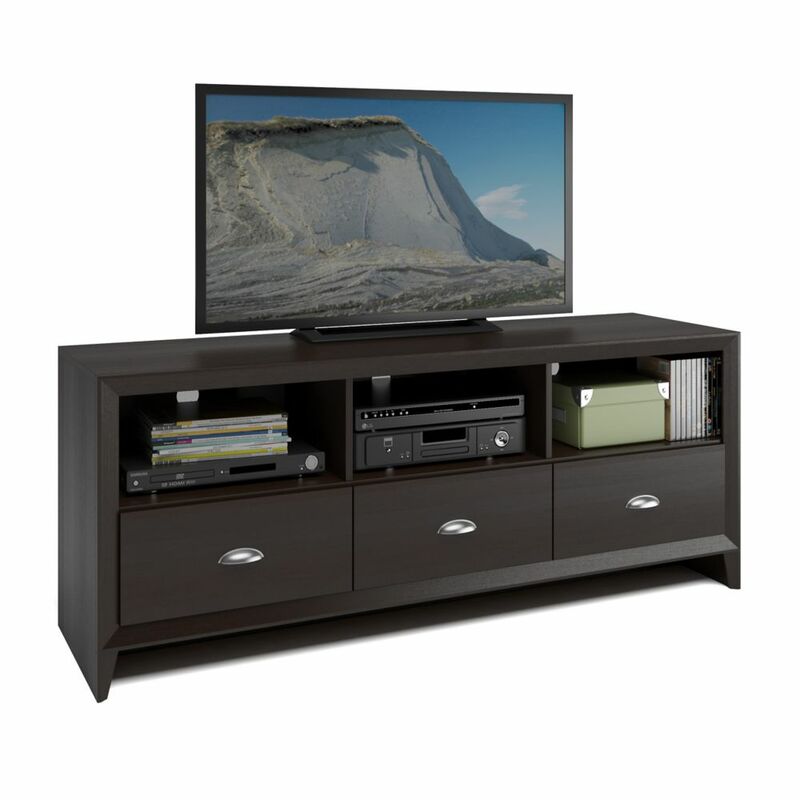 Complete your home dicor with the simple contemporary elegance of this dark taupe reclaimed-look TV console. Featuring 4 spacious storage drawers for your entertainment accessories and 2 open storage shelves for your electronic components, this piece is the perfect blend of fashion and functionality. Sleek track metal legs and silver coloured drawer handles provide a modern look that makes this console a must have in any home. Our extremely popular Vasari Flat Panel Plasma / LCD TV Console showcases your audio/video components with style. This sleek console holds TVs up to 150 lbs, and with four storage compartments, has room to spare for your DVD player, gaming consoles and other components you need nearby. Organize your electronics thanks to cutouts in the sturdy MDF backer that provide cable management, as well as ventilation, for each compartment. Durable and practical, its a great choice for your audio/video components. The Sonoma 72 inch TV stand's clean lines, contemporary and minimalist styling, and functionality will enhance any entertainment space in your home. This TV Stand has plenty of space to organize all of your electronics, media, and decorative accents. Its stylish design is crafted from high-grade composite wood and durable laminates that accommodate flat-panel TVs up to 80 inches. Six generous storage compartments will house standard-sized audio/video components such as a DVR player and gaming box and includes cutouts for cable management and ventilation. Each compartment has an adjustable shelf for larger components or decorative items, enhancing its modern aesthetic while providing tons of room for games, movies, controllers and more. It's the perfect addition to your home! Ships Ready to Assemble, includes an instruction booklet for easy assembly and has a 5-year manufacturer's limited warranty on parts. Manufactured in Canada and meets all North American safety standards. TEK-582-B Kansas TV Bench in Espresso Finish Admire the elegant and transitional design in the new TV Bench from the Kansas Collection by CorLiving. This timeless staple item is featured in our transitional Espresso finish accented with imitation nickel handles, 3 drawers and 3 open shelves. Offers a variety of open and concealed storage making it the perfect solution for your home theatre system. This timeless bench is perfect for your most important A/V components and can accommodate most TVs up to 60". Easy to assemble so you'll be set up in no time.